So when my skin started misbehaving at the start of this monsoon season; I made little changes to my CTM routine to suit my new skincare needs. And one of the changes was replacing my favorite rose water toner with Sebamed clear face toner. Now Sebamed is a highly reputed, effective skincare brand from Germany trusted by dermatologists world-wide. To know more about the brand and their products, you can visit Sebamed official website, here. Wash face with a gentle cleanser. Pat dry. Put few drops of Sebamed clear face toner on a clean cotton wool pad and wipe all over your face and neck before moisturizing. The deep cleansing face toner comes in a sturdy white plastic bottle with green and blue font. The packaging is straightforward and convenient to use. It’s an aqua green colored liquid with runny water-like consistency. Although, the scent is fresh and invigorating, it clearly indicates the presence of alcohol. I’ve been using Sebamed clear face deep cleansing toner for about a month now. And must say it has become a star performer of my daily CTM routine. However, my experience of using this was no lovey-dovey affair for the first week. I have oily to combination skin. And once my skin gets into the ballistic mode, it becomes very difficult to control. Quite rationally, I’m very picky about my skincare products. Having a past record of trying many new expensive products with zero to negative results, I was nervous to add this new face toner to my CTM routine. And the first week of use only increased my doubts about this toner. The first day I applied Sebamed clear face toner, it made my already oily skin even worse! My pores kept oozing oil all day and night! I thought of switching back to my personal favorite – Kama Ayurveda rose water toner but there was something in me that wanted this toner to work. So giving it another chance, I continued to use this toner for one full week! And guess what? The unexpected happened – my skin started behaving (or should I say, the toner started working!). My skin stopped shinning, oiliness came down to bare minimum and those minor zits gradually disappeared! And over a period of another 2 weeks, Sebamed clear face toner actually cleared my skin. I’m a fan now – no breakouts so far, no more blackheads and no more ugly large pores mocking back at me in the mirror. Lesson learned: When you are patient and persistent, amazing things start happening to you! So girls, sometimes you just need to give time or a second chance for something to work. 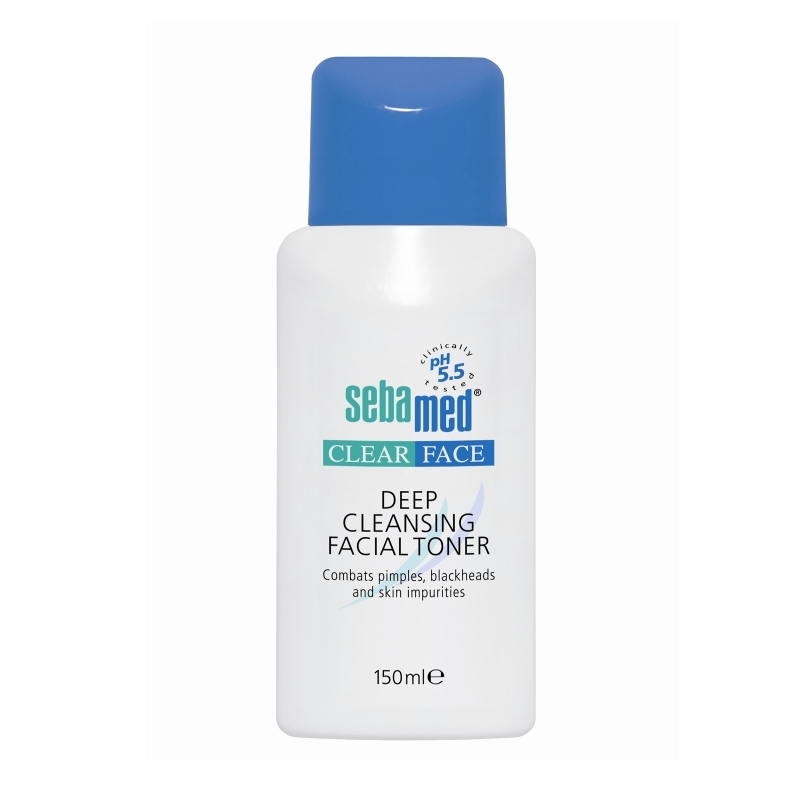 Overall, Sebamed clear face deep cleansing toner is a good face toner for oily, acne prone skin. It does help in preventing oiliness and controlling future acne break outs. But the fact, it contains alcohol and takes forever to start working is a big con. I remained persistent with this product mainly because it was my first Sebamed product and I desperately wanted it to work! So give this face toner a try only if you are a Sebamed fan, have oily skin and have all patience in the world when it comes to your skin and fancy skincare products! For others, there are better performing, lesser priced products in the market. So think before you buy! Oh, I just love their products. They have great solutions for women, but as well as for kids. Yes, they might be pricey but it’s worth every penny. The brand is new to me, but the information in the review looks promising. I’d want to try this product sometime. Where did you get it from? Hi Manavi. Thanks for stopping by. You should surely give this brand a try, indeed a promising one with great effective products. I bought this product an online shopping store: Aplava.com. It’s reviewed on the blog, you can a take a look on this website review too. I didn’t know Sebamed had toners… after reading your review I’d better skip this. can we use this toner and sebamed clear facecleansing foam more than twice daily?..also,it is ok to apply another makeup after use the toner? Hi Faranah, Washing your face more than 2-3 times can rip your skin of its natural moisture leading to early appearance of fine lines and wrinkles. It’s best to stick to using cleanser only two times daily. You can of course, clean your face using plain water or rose water any time of the day. This brand is new to me, however, I like how it comforts the skin so I want to give it a try. I know it will be worth to try. Thanks! Interesting blog, good information given about sebamed clear face deep cleansing toner. Was very useful, thanks for sharing the blog with us.